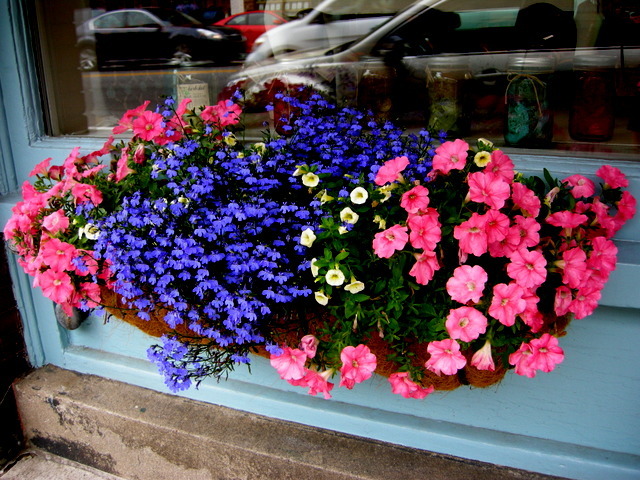 This beautiful window box full of my favorite color flowers was outside a storefront in Camden, Maine. As I mentioned in my last post, Michael and I recently visited Camden, Maine, to attend the Camden Garden Club House and Garden Tour. 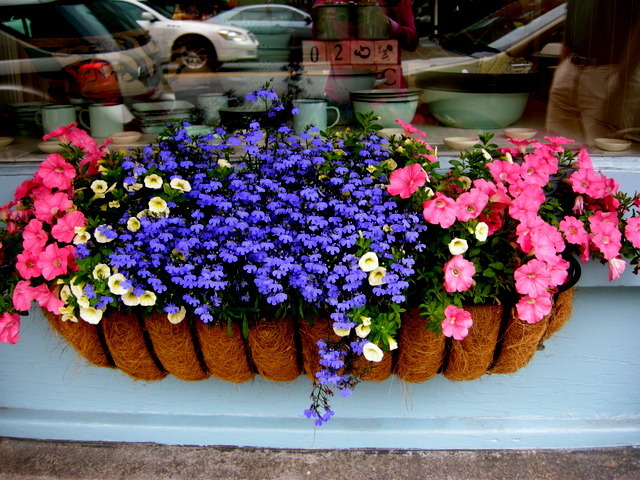 The town is full of inspiring container ideas. So many, in fact, that I split the photos into two posts. 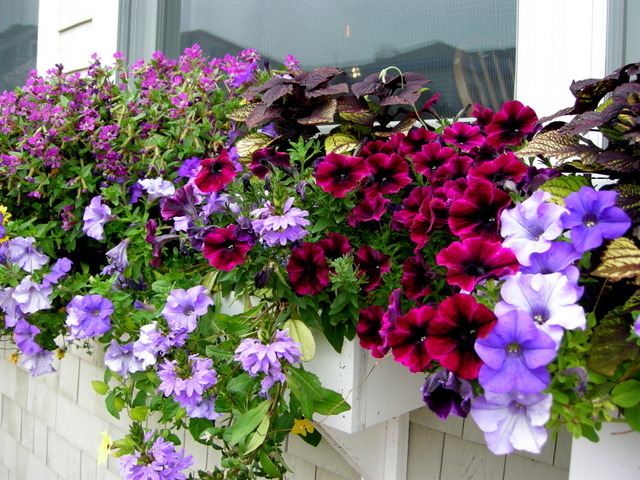 This one covers window boxes, and the previous post pictured pots and hanging baskets. To read it, click here. 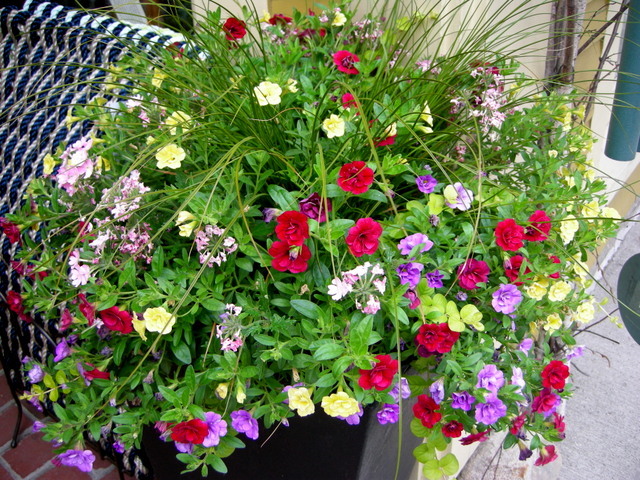 In containers, you can often use colors that wouldn’t necessarily go well together in the garden. 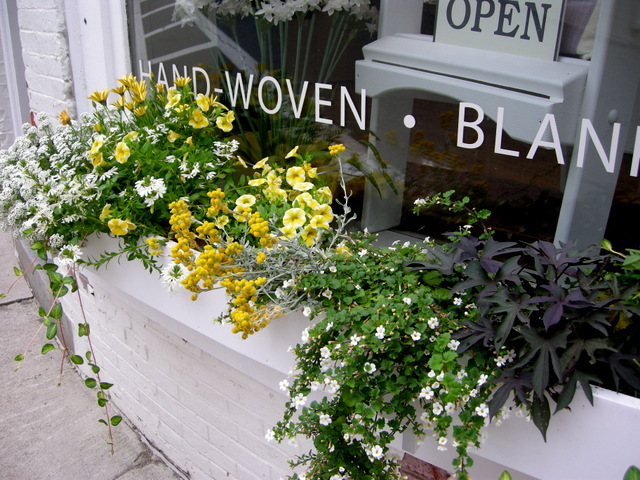 I was very impressed that most local businesses in Camden invested in flower-filled containers along the sidewalk. 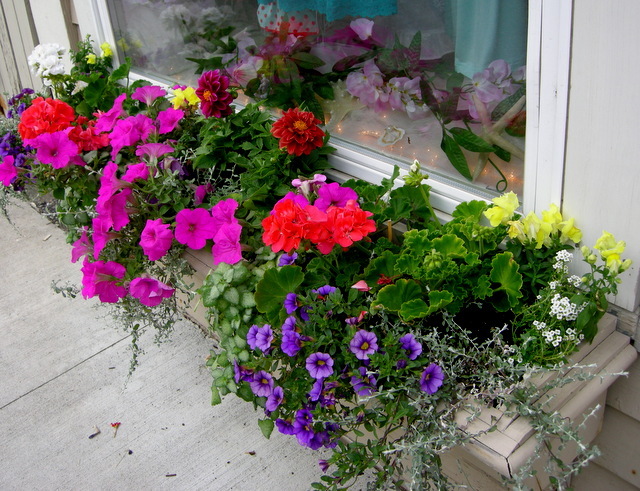 It was very attractive and complemented all the plantings maintained by the Camden Garden Club. The Camden Library grounds are especially beautiful. Even if you are just passing through Camden, it is worth stopping to walk around. The harbor is gorgeous, and there are lots of wonderful restaurants—more on that later. This display was particularly creative with the use of a wooden oar and driftwood in this seaside town. It is not necessary to get fancy: very traditional and very pretty. 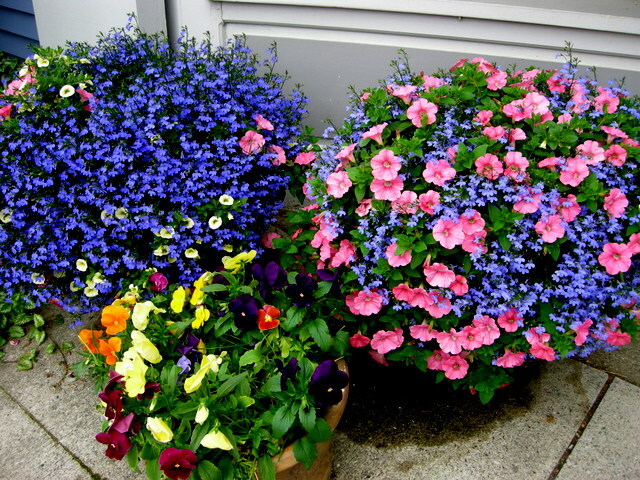 There is a tendency to go with bold colors in containers, and I do that myself. 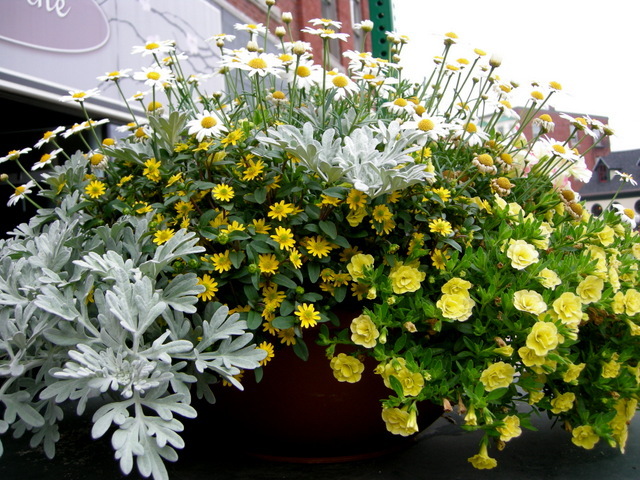 However, this combination of yellow, white, and silver is quite elegant. 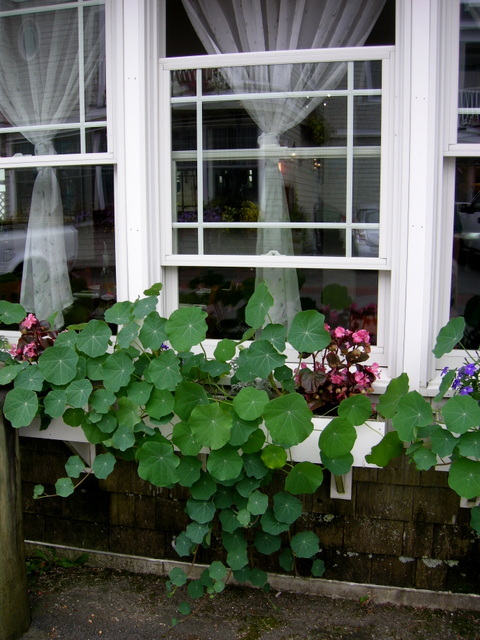 We saw the chef from this restaurant collecting nasturtiums for culinary use. 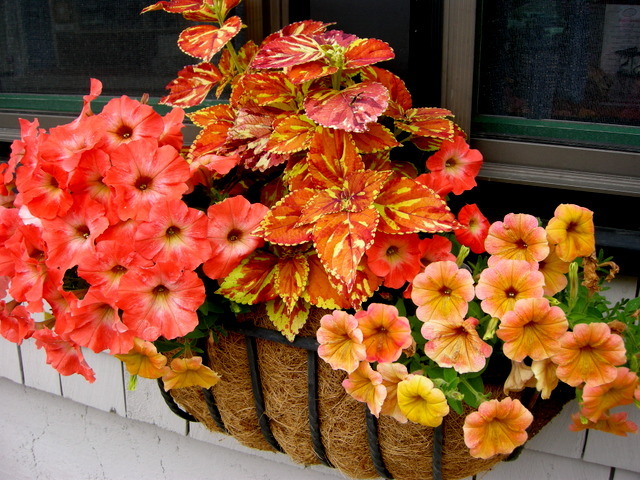 Containers are not just for viewing. 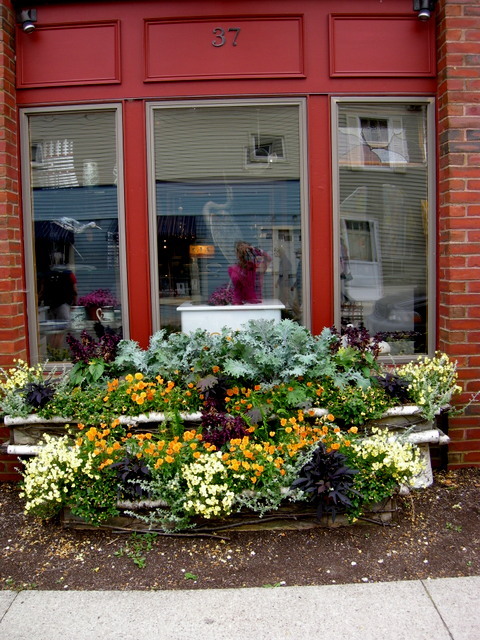 I intend to put my basil and parsley in my window boxes next year. 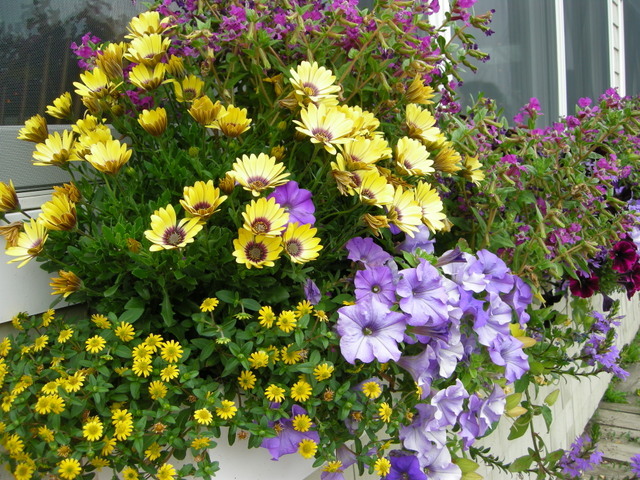 Unlike plastic pots, baskets lined with moss or another organic material are aesthetically pleasing when first planted and the container is still visible. 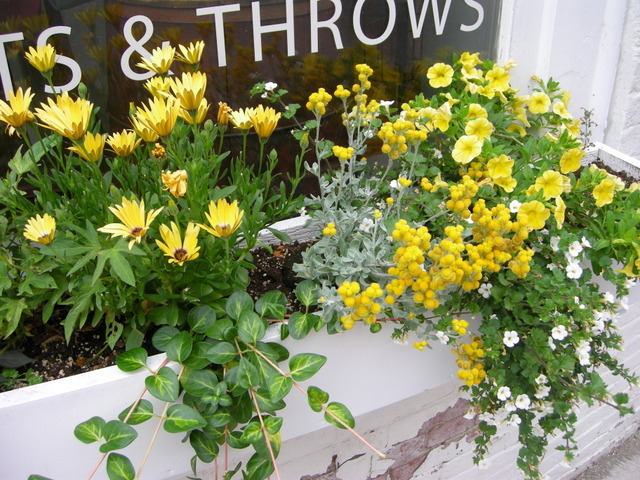 This restaurant down by the waterfront went all out with window boxes lining both stories. 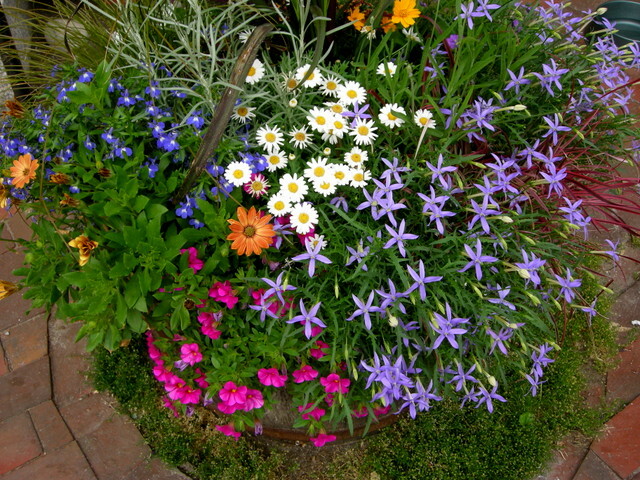 All the remaining photos are of planting combinations from this location. 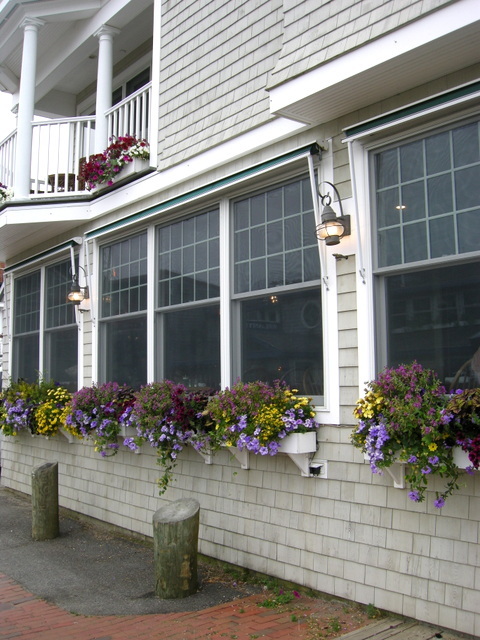 Restaurant patrons seated by the windows got not only a beautiful harbor view but also lovely flower arrangements. 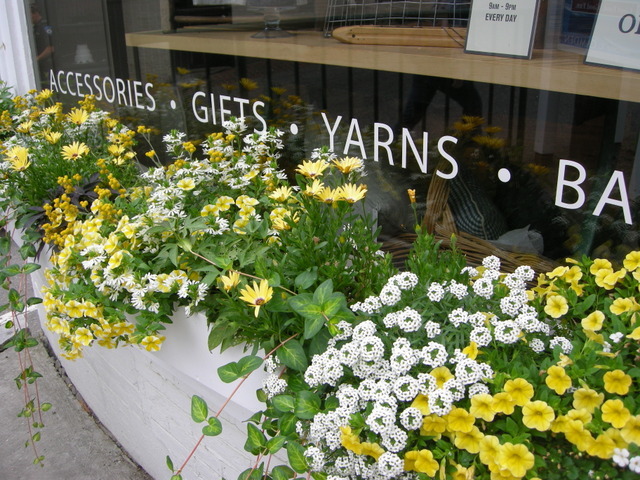 I hope you have gotten a few ideas from Camden’s flowers—I know I have! 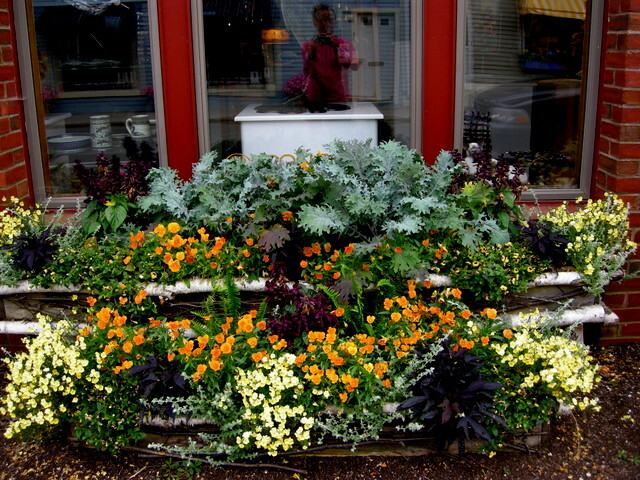 The display outside a storefront in Camden, Maine. 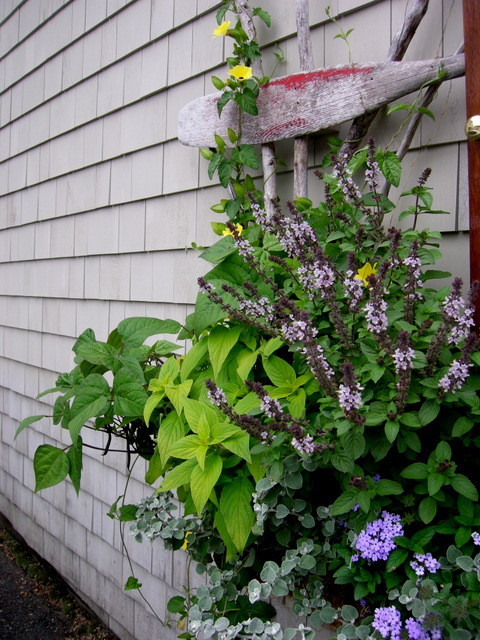 Michael and I visited Camden, Maine, for the third year in a row to attend the 68th Annual Camden Garden Club House and Garden Tour. 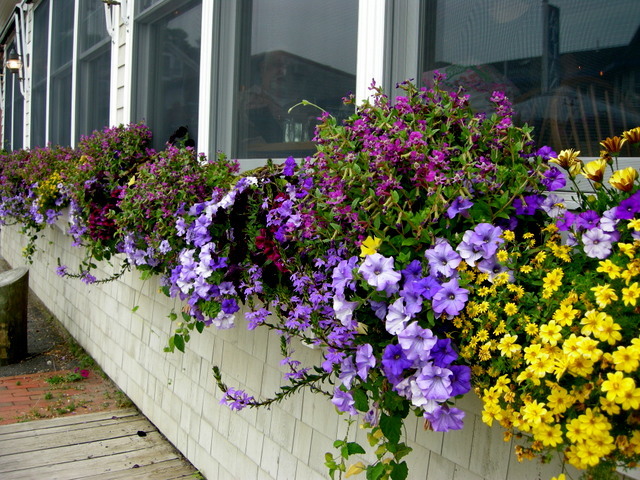 Readers love my posts from Maine so I took lots of photos while I was there. 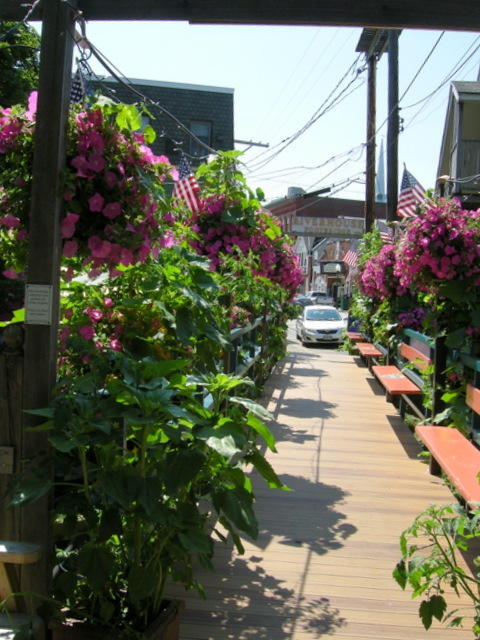 The garden club maintains most of the public spaces in Camden and seems to have inspired the town to go wild with containers outside many of the homes and businesses. 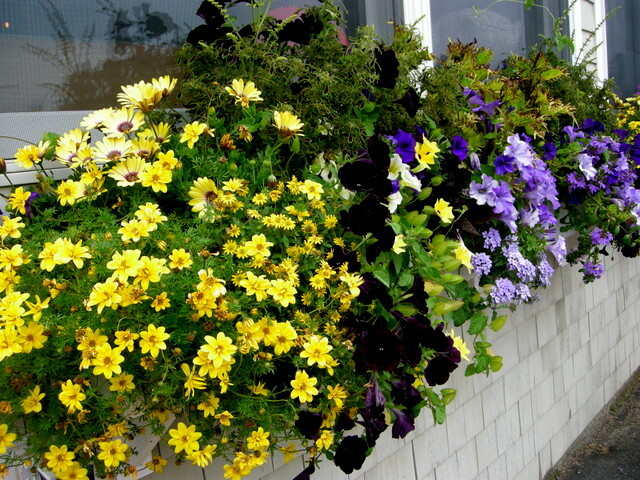 I take lots of photos of creative containers over the summer. 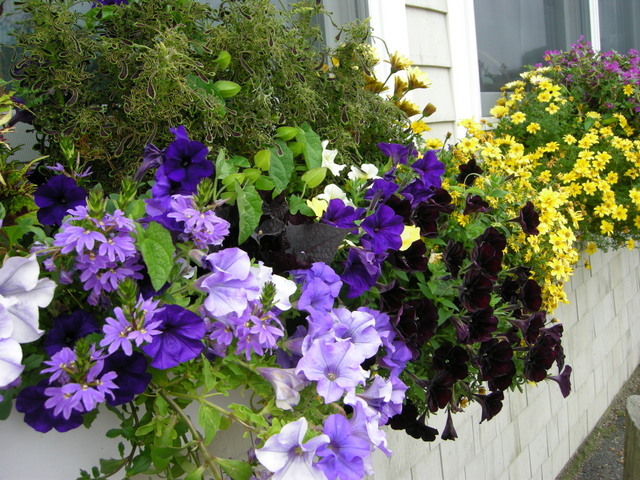 I have been reluctant to post a lot of them because most people probably have their pots, window boxes, and hanging baskets filled by late July. This year I am forging ahead though, hoping that readers will get some creative ideas for next year. In fact, I found so many beautiful combinations in Camden that I have split the post into two parts: this one will cover pots and hanging baskets and the next will be window boxes. For some advice on container design techniques, click here and follow the links in the first paragraph to three other posts. 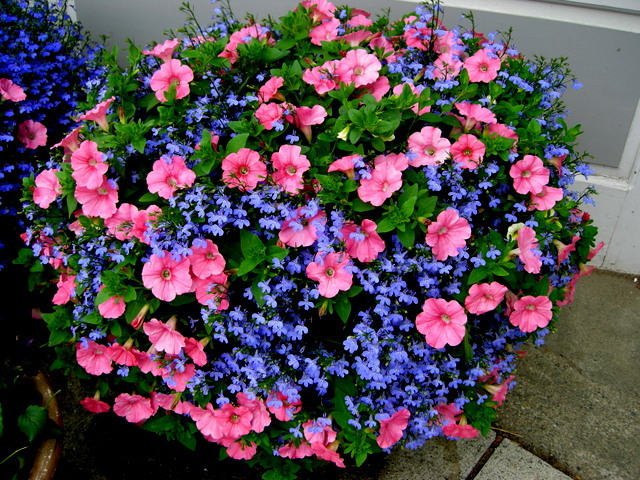 It is not necessary to get fancy: a container of ordinary pink petunias and blue annual lobelia is lush and beautiful. 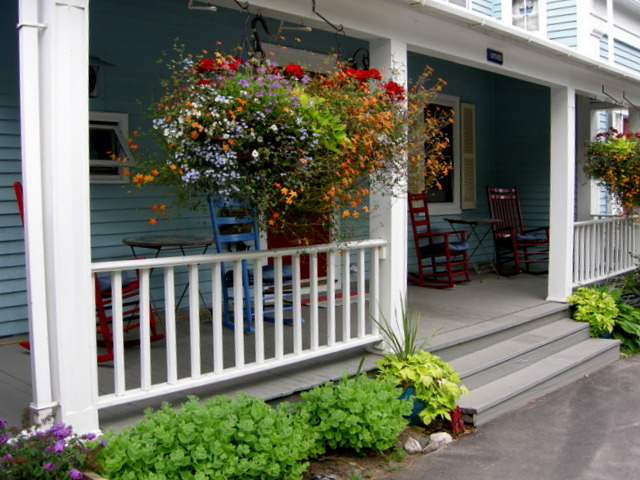 Hanging baskets echo the colors at this local bed and breakfast, The Blue Harbor Inn. 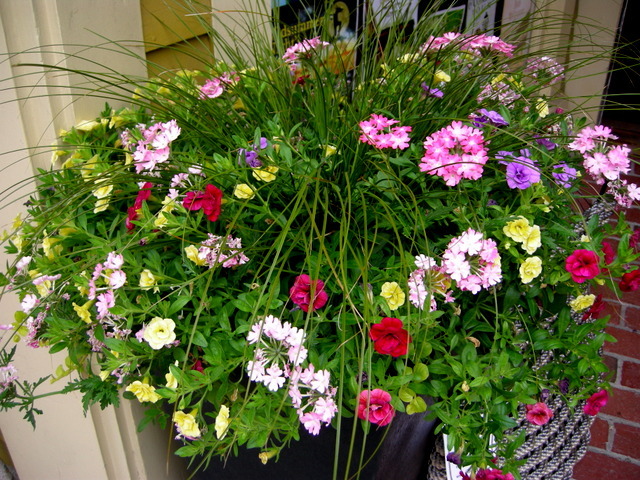 A close up, hanging baskets look the best when they are filled to overflowing and the pot is not visible. This more subtle and elegant combination was sitting on the top of a trash can in downtown Camden. The other side of the container on the trash can. 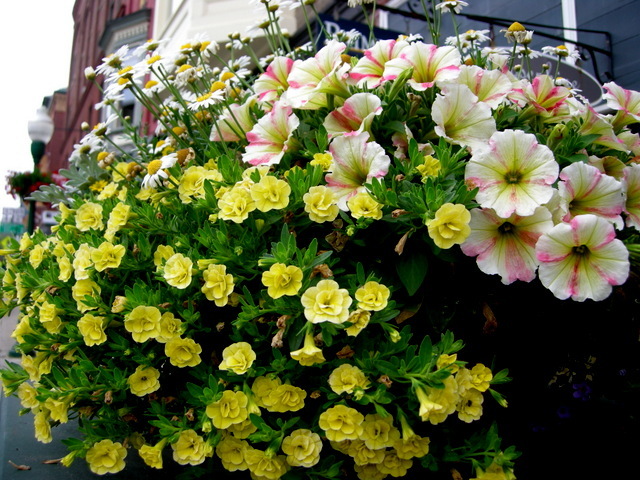 Petunias used to be somewhat boring, but there are so many elegant cultivars available now, here white with delicate yellow and pink shading. The yellow blooms are double-flowered million bells. 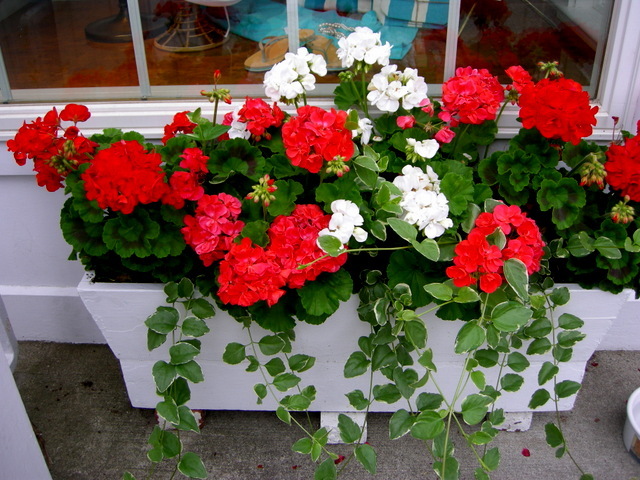 If you are looking for a tall, narrow effect, this container and another identical one flanked a store entrance. 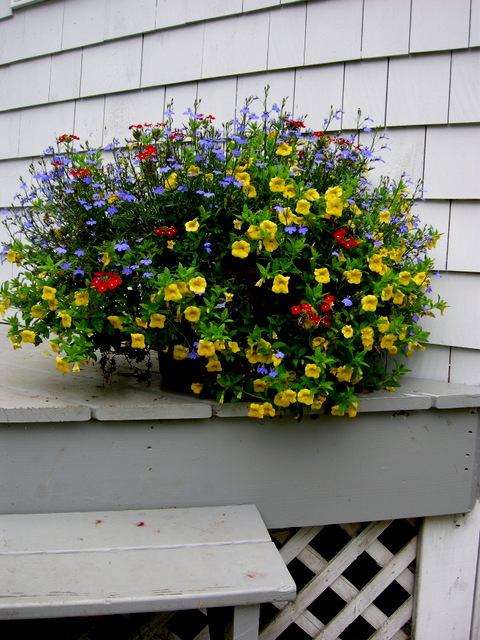 A cheerful combination of red annual verbena, yellow million bells, and blue annual lobelia. 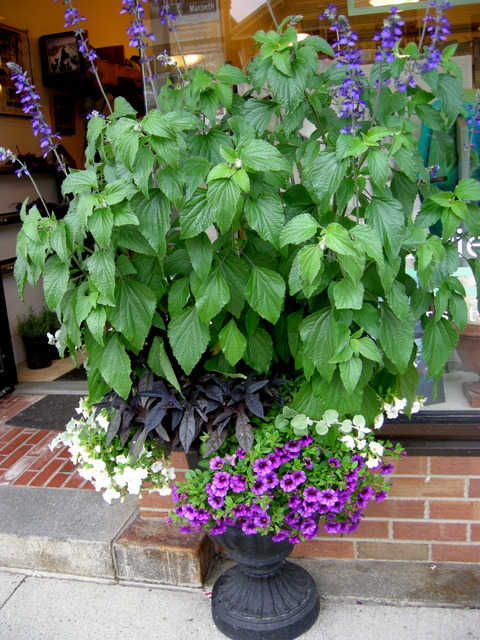 Another pair of containers at a store entrance using verbena and double million bells. The grasses give the the pots an added bit of interest and elegance. This large display (also pictured in the first photo) was definitely my favorite. 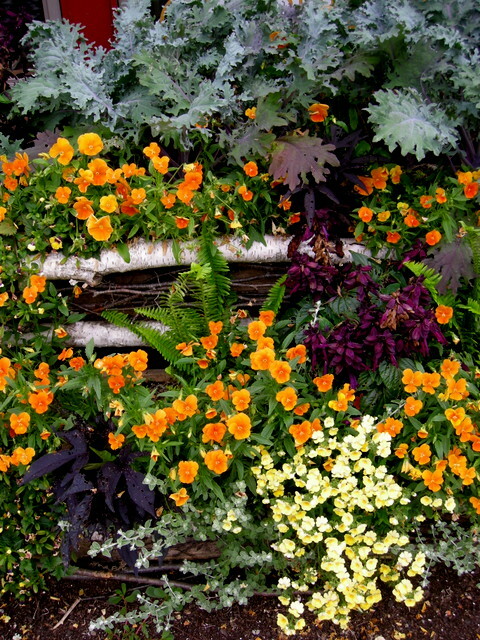 The color combination is subtle yet eye-catching, the textures are interesting especially the kale in the back, and the rustic containers are very attractive. 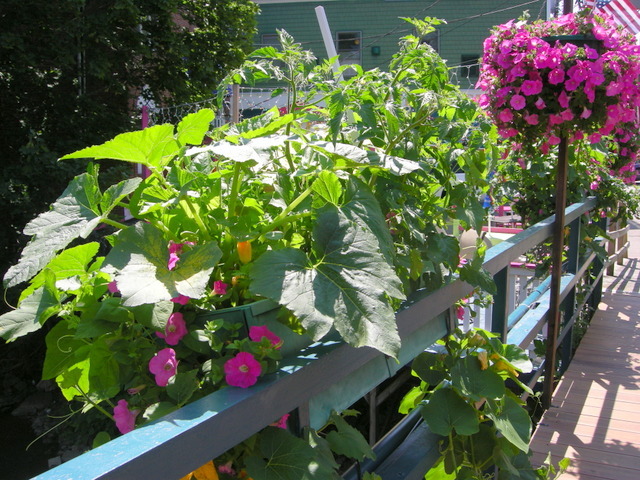 This pedestrian bridge was lined with containers of pink petunias, tomatoes, and squash, a utilitarian yet attractive combination. 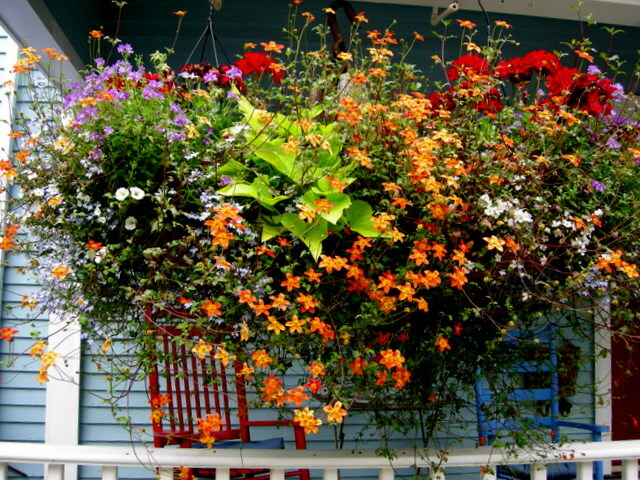 I love the idea of walking out on my deck to harvest vegetables and may try this next year. 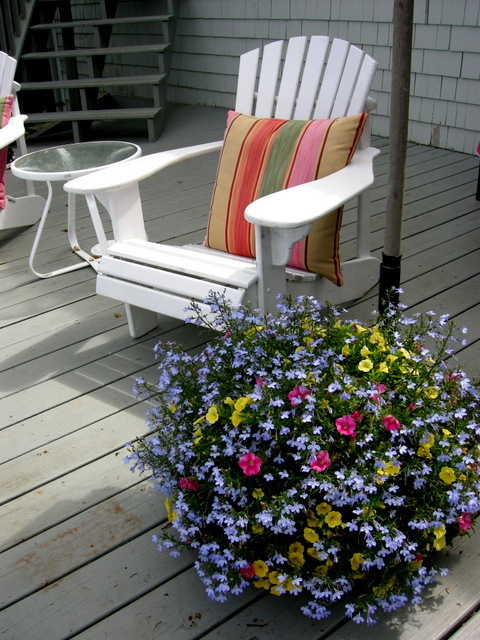 This last photo shows a traditional Maine scene with a simple but beautiful combination of pink petunias, yellow million bells, and the less common and very lovely pale blue annual lobelia. I hope you are enjoying summer!